When we asked in earlier posts about guest posts, Amy and Nate of the blog Marking My Territory were happy to help us out with a post. Below is their guest post for Appalachia & Beyond and in our opinion is a great post that leads us to remember some of the essentials about hiking with our four-legged companions. We couldn't agree more, that research of the trails you're hiking is tantamount before heading out with your "best friends". We hope you enjoy the post. P.S. We are all doing great by the way. Some major adjustments have been made and we are starting to get the hang of the whole baby thing again. We should be back to regular blogging in a couple more weeks so we apologize in advance for those who are missing the FGR's and what not, we're sure you all understand. Now to the Guest Post. 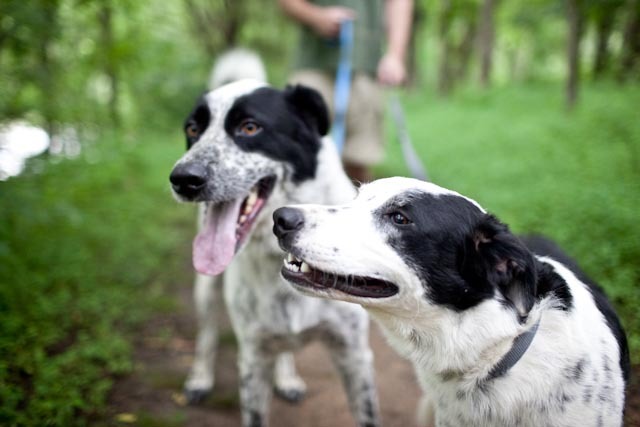 Getting on the trails with our dogs is a highlight of our outdoor activities. It's great to get out and test not only our limits, but also to watch how our dogs grow, adapt and learn how to handle new challenges. (And the blissful satisfaction of finally wearing out a slightly-crazed 18-month-old pup cannot be underestimated!) However, our experiences have brought to light some things that are important to take into account when hiking with man's best friend. Recognize that your dog has limits. When my husband first took me hiking on one of our early dates, I assumed that Ezra, my 99 lb super-mutt, would blindly drag us headlong up and down every trail. It wasn't until we found ourselves stuck in the middle of a suspension bridge with Ezra immobilized by terror, bearing down from his fear at catching glimpses of the river through the bridge's slats, that I discovered that hiking with dogs presents its own set of challenges. That was the first instance, but it certainly isn't the last time we've had to adjust our hiking plans because of the dogs (including my husband's first attempt to ask me to marry him). Limitations for dogs on the trail come in all shapes and forms: lack of stamina, inability to handle the weather (we have to limit hikes with Ezra when it's over 80 degrees), difficulty maneuvering over rugged terrain, lack of water, fear of heights and inability to scale ladders or rickety staircases are just a few things we've run into with our dogs. Avoiding these problems can be easy with some due diligence. Do some quick research about the area you'll be hiking in (make sure dogs are allowed - many state parks and nature preserves ban dogs), make sure your pup is in shape for what's ahead, throw a water bowl and extra water in your pack then hit the trail. Other hikers (human and canine) may not like your dog. Growing up, my brother and I had a dog. Even though our mom spent every day around Cinnamon for 16 years, she's still incredibly uncomfortable around dogs. This goes for a lot of people. Often times dog owners take for granted that everyone will think their pup is charming, cuddly and adorable. That's not always the case. Many people are highly wary of dogs and not all dogs are well socialized. And when an unsocialized dog encounters new dogs, sometimes fur flies. While there's a freedom that comes with letting your dog roam off-leash, you never know who (or what) you'll run into on the trail. That's why we advocate keeping your dog on a leash. A recent outing turned sour when we had a couple of encounters with aggressive off-leash dogs, including one where the off-leash dogs started a fight with our leashed dogs. The scuffle was over quickly enough, but the stress of it brought a cloud over our nice, quiet walk in the woods. A good friend of ours had a dog that was immensely skittish (the dog was on Prozac... seriously.). She would occasionally lament, "Everyone thinks that just because their dog is friendly everyone else's will be too, so that leaves me dragging June away from dogs that run up to her and apologizing to the owners -- even though they're the ones who let their dogs loose in the first place." 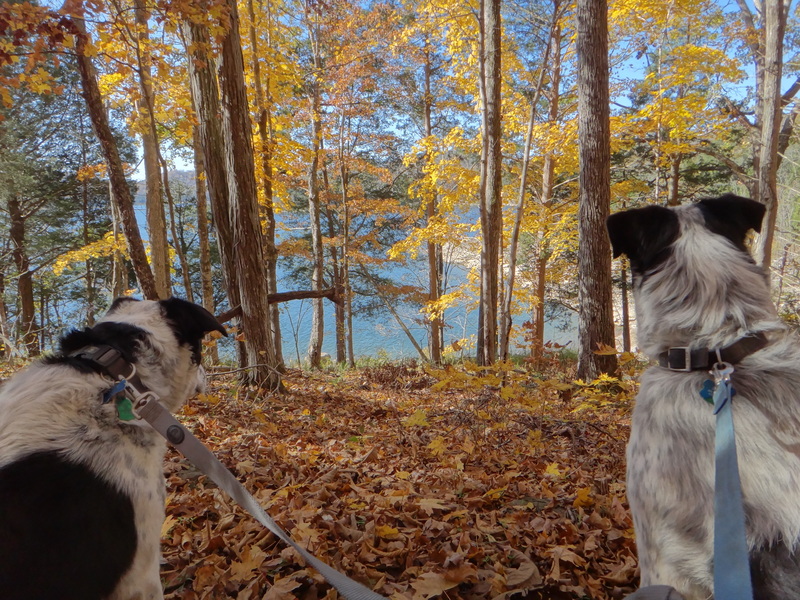 Another blogger, Leah Scott at Eastern Mountain Sports, wrote a post about how nearly losing her dog on the trail taught her an important lesson on leashing her dog during hikes. Leashing your dog is a way to be courteous, responsible and respectful to other hikers. And I promise, your dog's hiking high will not be diminished in the slightest. Get ready for "Plan B." If there's anything we've learned from hiking with our dogs, it's that there's always the chance we'll have to figure out an alternate plan. This goes for life beyond the trail, too. You dog truly wants nothing more than to please its owner (and in Ezra's case, to avoid suspension bridges at all costs). Keep a good sense of humor about it, reroute and don't let it keep you off of the trail. Your dog will love you for it. Amy and Nate live in Nashville, Tennessee, with their dogs Coltrane and Ezra O. Their blog, Marking My Territory, provides "trail reviews for dogs and their humans" along with insights and tidbits to make hiking with your dogs a relaxing and enjoyable experience.